Mageia: Is It A Kind Of Magic? I like to keep my promises. But sometimes I break them. Few months ago I promised to dump Mandriva Linux. I was not happy with it and did not want to return to it. But later I had another review of it, because I had an opportunity to try another flavour, new release. This time I almost broke my promise again. I will review... no, not Mandriva. Today's specie is Mageia. This is Mandriva's fork which was created after some changes in Mandriva's management. Mageia is very young as organisation, it was founded just few months ago. But Mageia as Operating System inherits all the legacy of Mandriva and evolves it to the next step of evolution. First releast of Mageia (coincidentally called Mageia 1) was released on the 1st of June 2011. Mageia 1 is available as installation DVD and Live CD version, and also netinstall. Of course, my choice was for Live CD. There are several flavours of it, and I chose Europe 2 KDE option, because it includes Russian locale and my favourite desktop environment. My first attempt was to use Unetbootin to "burn" this image to USB drive. Even though Unetbootin did its job without any error, USB was not workable. Yes, it booted system up to the splash screen and I could see progress bar slowly moving right. But 10 minutes of wait time was more than enough. Finally, I burnt CD-RW. It is loaded into my Compaq laptop's drive. Reboot. Let's go! Relation of Mageia and Mandriva Linux was visible from the very beginning. Again I was asked about a dozen of different questions before I saw real desktop: language, keyboard layout, timezone etc. I am not sure that all of these questions are so much important in Live mode. What was interesting, language selection contains separate lines for "English (US)" and simply "English". I hope that just "English" means British variant. I selected that option. Boot time of Mageia again, like with Mandriva, was very long. It took system about 5 minutes to get me from cold start to the desktop. Later I also noticed that all the program took significant time to start. Of course, I can blame Live CD version which has to read everything from CD, but I had other CD systems which worked much faster with same software and disk. To be fare, once started programs work fast in Mageia. Default desktop wallpaper in Mageia is very boring. It reminds me set of default tiles from Windows 95. Luckily, there is good selection (about a dozen) of wallpapers on CD, so you can chose whatever you like. There is even one very similar to Kubuntu default splash screen, I believe this is standard KDE wallpaper. If you're not happy with delivered set of pictues, nobody stops you from using your own. Default colour theme is quite strange. White control elements on light-grey window headers for non-active windows are not the best idea from my point of view. Once booted, Mageia did not find drivers for my WiFi card Broadcom 4311. Log in dmesg sent me to kernel.org page with instruction to compile fwcutter and driver. Unfortunately I did not manage to compile fwcutter: command make was not recognised by Mageia. Further Internet researches took me to the page http://hany.sk/~hany/RPM/f-updates-14-x86_64/b43-openfwwf-5.2-5.fc14.noarch.html . It contains RPM file with driver for my WiFi card. RPM itself was created for Fedora Project (Fedora 14), but users on Mageia forum claimed it worked in their system. I installed driver and it worked for few seconds until I entered security key and pressed "Connect" button in Network Manager. And then... system was frozen. I was quite suspicious what caused this effect, but decided to give it another go. Second attempt was much better. My WiFi card was activated, I could find my network, enter my security code and use Internet. This post was drafted in Mageia. I still don't understand why this RPM was at all required in Fedora which supports Broadcom 43* WiFi cards out of the box. But developers can have their own view. What is more important for me is result. What is included in Mageia? Firefox 4.0.1, latest stable release of famous browser. Of course, I would prefer Chrome or Chromium, but that is minor issue. Google has RPMs for installation. Mageia contains lots of other Internet tools. I won't even try to list them all. They are mostly KDE-specific applications, like Kontact. Libre Office included if you need to process documents, spreadsheets and presentations. There are several tools in Graphics section of Mageia's menu, but GIMP is not here. Amarok is default audio player, Dragon Player also included. What is NOT included in Mageia? Unfortunately MP3 files are not played out of the box. I could not manage to play them at all which was quite confusing. Probably some 3rd party repositories are required. My usual way to install MP3 decoder is to get VLC player. Unfortunately, VLC is not included in default repository, at least not available in Live version. Youtube videos did not play out of the box, but Adobe Flash player was installed in few clicks. Of course, both these lists are far not comprehensive. If you need more software, you can use Software Management tool which is actually Rpmdrake 5.26.10. I'd like to mention here that there are 2 configuration utilities in Mageia: System Settings (KDE standard) and Mageia Control Centre. From first glance, they duplicate each other, and I don't understand why both are required. From my point of view, design of KDE standard tool is more convenient. I managed to connect to me external network drive from Dolphin without any issues from Mageia. It automatically supports Russian characters in file and folder names. Unfortunately, as I wrote above, my connection did not allow me to play music which is stored on network drive. Simply because there was no decoder. But otherwise I had no issues with this functionality. Dolphin itself has new feature - columns view. It is default layout when you have enough space in window. I have used it for few minutes, and it seems to be very interesting and intriguing feature. Default keyboard layout was GB, because I selected it during the boot. Actually, I only confirmed system proposed one. Proposal was most likely worked out of English language selection made earlier. I also managed to add Russian keyboard layout without any issues. This configuration is placed in System Settings - Hardware - Input devices. Whole operation took me 1 minute maximum. Mageia is fork from Mandriva Linux which itself is one of the most popular in the world. Independent team now puts efforts to make this OS even better. And from what I have seen today, these efforts are very productive. I am very positive that this OS will gain supporters and fans. Will I become one of them? Why not? I am still looking for replacement of my *buntus. Mageia is very good option, in my opinion. Decision was made to replace *buntus, but there was no decision so far about the replacement system. Let me think about this for some more time, and I will tell you about my choice. PS. I only noticed after reboot that I have not done anything in terminal mode, except for command dmesg and attempt to compile driver. Is it user-friendliness? Yes, as I understand this word. Do you want to try Mageia 1 yourself? Why not order it from Buy Linux CDs page? It is Gnome based, but this will work for KDE as well. I will give Mageia a few more releases before I will consider it to replace Mandriva. Over the years I have seen Mandriva going through bad patches, but they always seem to come back better and stronger. Looking forward to the new release in a couple of weeks! Mandriva, with all its utilities, tools, and polish, will always be one of my favorites. It has been a rock solid distro that I have used for years in many applications, from embedded monitoring systems, to full blown servers, to grandmas computer. You name it. 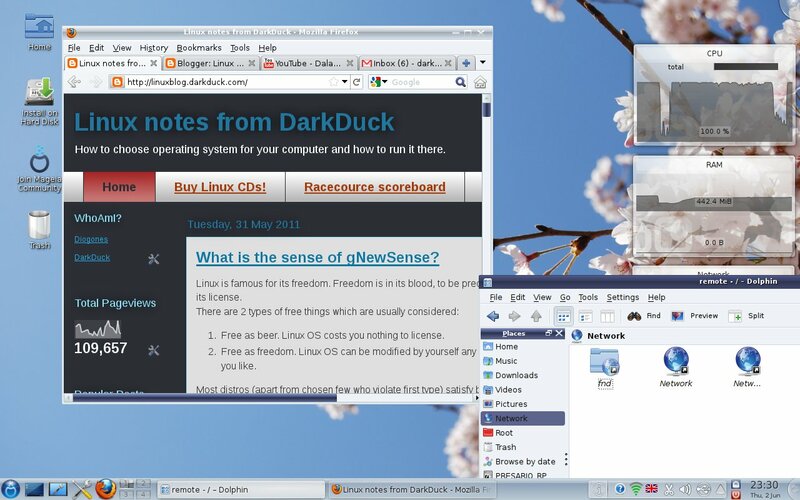 It is by far the easiest to use linux distro out there. I'm sure Mageia will be just as nice and easy to use as allot of Mandriva's development and polish will be there. And Mageia will begin to introduce features and improvements of its own. Mandriva realizes it has direct competition. Hopefully that will drive improvements that normally wouldn't be made. Several years ago, I accepted a contract to migrate a portion of a small real estate company to Linux. They wanted to try it on a small percentage of their machines and explore the feasibility of a complete changeover. Booting the Ubuntu Live CD, I ran into trouble immediately with the huge Ricoh print and copy environment in this company. It simply would not recognize any of the hardware. Booting Mandriva immediately not only recognized the hardware, it asked if I wanted to configure it. Mandriva (at the time) supported hardware that even Ubuntu ignored and I am impressed with the enterprise-level support Mandriva provides. I hope those that develop Mageia recognize and continue this support. I tried Mageia via vbox. I was very pleased with the product and will consider changing my computers to it. I did manage to get the mp3 codecs working, but could not find how to install mp4 and win32 codec support. If I can solve this problem, I will probably consider the change. You probably have the "Tainted" repos already activated, but if not do that first. Then install the gstreamer-bad and gstreamer-ugly packages. I believe they provide win32 codec support. the best *buntu replacement? Sabayon KDE! Unfortunately the link is broken. Can you submit it again? I would be ver interested to have a look! I activated Tainted media, but this does not help. Maybe because I am in Live mode booted from CD? I had some issues with Mandriva, as you may see from linked (in the post body) early reviews. But I am happy with current Mageia state. It is better that one could expect from v.1 of OS! Competition is always good. But too much competition kills the idea. Look at Ubuntu world. Only lazy people did not create own Ubuntu spins. Thanks for sharing a story! I've never tried to print from Linux yet. I don't print much from home, and I have another laptop with Win7 where all the printer drivers installed. I just don't need Linux for printing. I have Tainted ativated. But neither gstreamer-bad nor ugly is there. Maybe because of Live version? I have seen that unetbootin never works with Mandriva. Same with OpenSuse for me. However, writing with win32 image writer https://launchpad.net/win32-image-writer seems to work for OpenSuse. I haven't tried Mandrive, but please try. By default, the win32 image writer will look for an .img file, but you could force it load an .iso file. Unetbootin is probably not working because iso are hybrid, you could simply give a try to dd for dumping the iso on the usb key, there's also mandriva-seed. Regarding mp3 support gstreamer0.10-plugins-ugly should be available on the live cd & then amarok should play mp3 without problem normally. VLC is of course available on core/release repository (& also with additionnal codecs support in tainted/release repository). hum i just check the file & indeed gstreamer0.10-plugins-ugly is missing. I tried the new Ubuntu, but I encountered several issues; I since replaced it with Mageia on two Compaq laptops and the experience is much smoother (except for the Ruby SOAP4R gem). This review sounds like another (k)ubuntu user wondering why all distributions don't work like theirs. I would also suggest if you "review" any distribution that you install it instead of just running it off a CD. Also, as previously stated, dd is a fine tool. These boot and see reviews don't mean much at all, even in the (k)ubuntu world. Mandriva is seriously the best KDE-based system out there. But I currently use PCLinux0S for one reason - it's a rolling release. No need to reinstall from scratch (and reload all my apps) every year. PCLOS is no slouch either, but it feels slower than Mandriva used to on the same hardware. I'm planning to check out Mageia too. By the way, recent Mandriva releases had no problem with Broadcom WIFI. Anyway, it's actually quite a shame, because if there were a marketplace that supported OEM's including Linux, Mandriva could've built a nice business around a rolling release version of their system. But as it is, Mandriva's left with no business model except to get people to pay for each new version (the few that actually *do* pay). I love Mageia, I'm running it right now. I had the same experience with the Unetbootin flash drive, so I burnt a CD-RW. It was extremely slow in Live mode, so I installed it to the HDD. Once installed, it flew. The only driver I didn't have was my graphics card (even though it says on their website that those are included) so I installed that using the package manager and XFDrake. After that, it's been smooth sailing. There are a few codec issues, even after I installed VLC. It's funny, that usually plays everything but it wasn't wanting to play everything I have, but the rest plays on Dragon, so it's all good. I also replaced Firefox with Google Chrome and installed the essentials like Gimp and Inkscape. Nice review. I agree, this system has a lot of promise. I've been somewhat disillusioned by the Mandriva sale and haven't exactly jumped at the Mandriva offerings of late, though I will try Mandriva 2011 after it goes stable at the end of the month. Thanks for advice about dd. I am in Mageia from my USB stick now. It works much faster than from CD. Although, I still wish it to boot a bit quicker. I also added all (not just default) media sources, and now I see VLC in the list. Installed and HIYAAAAAAA!!! MP3s are playing!!! Many thanks! Most helpful comment in this post! I don't use and don't need Ruby. Maybe only as a user of web sites. So far, Mageia looks very smooth for me. I usually do Live version reviews. I gave reasons about it earlier. Won't repeat again. If I install Mageia on my HDD (pretty possible BTW), I'll make another review of installed version. Yes, I remember last Mandriva to work OK with my WiFi card. I was very surprised about Mageia's behaviour here. Especially when FOSS driver is already available for some time. Thanks for comment! I am especially happy about your comment that HDD install flows very fast. Another 5p into the "do install" for me. I'll wait for Pardus amd Mandriva fresh releases though. I've never had a really clean USB come out of unetbootin. The latest was Parted Magic 6.1, in which unetbootin changed the file pmagic-6.1 to PMAGIC-6.1. Several other people on the PM forum had the same experience. Probably Microsoft sabotaged the program to make Linux downloads fail (their names don't care about capital letters, ours do). Where can I learn to copy .isos to USB with dd? I used dd to make a Live USB and it worked perfectly. The Gimp IS part of the Live release, I don't know why you couldn't find it. mp3 codecs are not free, and therefore are not part of the standard package. However, if you enable the tainted repos in the package manager it is very easy to download and install them. I started using Mandrake in 2001, version 7.2. Stuck with until2001 when I found PCLOS.Stayed with PCLOS until 2010 when I tried Mint. I rebuilt one of my systems a couple of weeks ago. MSI 760GM-E51 mobo, AMD 640 quad core processor, 16 gig DDR3 ram. Tried the Mageia live CD, and decided to install it. Ran into multiple problems. Gentleman, on the forums, suggested I try the 64 bit DVD. Installed in 12 minutes, and works great. I may replace Mint with Mageia. Still checking things out, and it will probably take me a couple of weeks to get everything completed, but it looks promising. I tried Unetbootin under Linux and under WinXP. it either works on not, independently from platform. You are right. Live US works with dd command. Mikala wrote above about GIMP. It is available in GNOME edition, but not in KDE. This review is about KDE one. You have impressive hardware. You can no doubt launch any OS on it and it will fly like a spaceship! I agree that Mageia looks promising so far. Yes, Fedora does not support BCM4313 OOTB. It requires a separate RPM to be installed. I linked that RPM in the post. The same RPM works in Mageia 1 too.